Whether yours is an open-plan nook or a separate, formal dining room, comfortably fitting the whole gang around the table often proves to be a challenge—especially when the same space also needs to accommodate tableware, linen, and accessory storage. 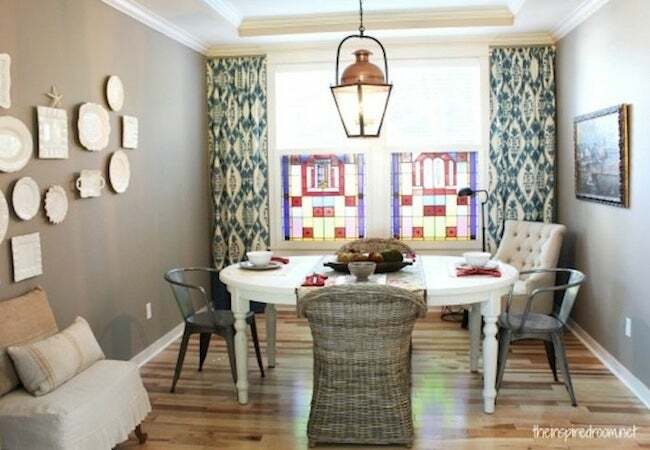 Fortunately, there's more than one way to maximize square footage and make your dining room feel bigger than it really is. Read on for ideas! 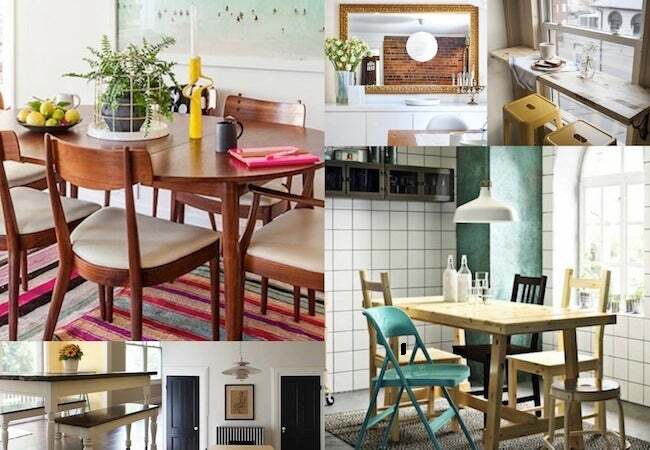 A dearth of space in your dining area need not put a damper on your next get-together. Yes, even if your eating area looks and feels rather small, it’s still possible to entertain with warmth and grace—and to give your friends and family a bit of extra elbow room too. 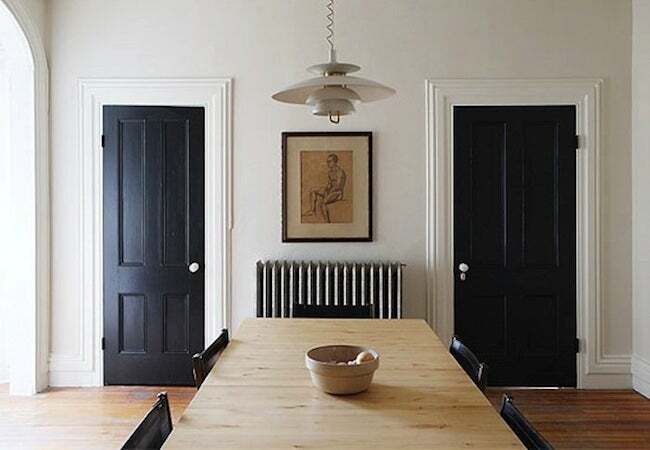 Scroll down now for smart and simple ideas, not for adding square footage in the dining room, but for making the most of every inch that you do have available. Bon appétit! A familiar feature of modern kitchens, open shelving represents a space-smart dining room storage option—one that frees up floor space even while adding visual interest. Best of all, if you’re handy enough to drive a few screws, you can handle installation yourself, without having to go through the hassle and expense of working with a contractor. 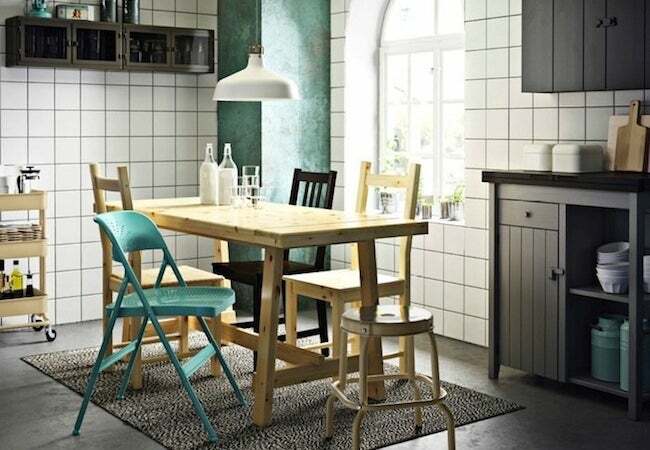 Simply put, traditional dining chairs take up more room than basic bench seating. Remember that. 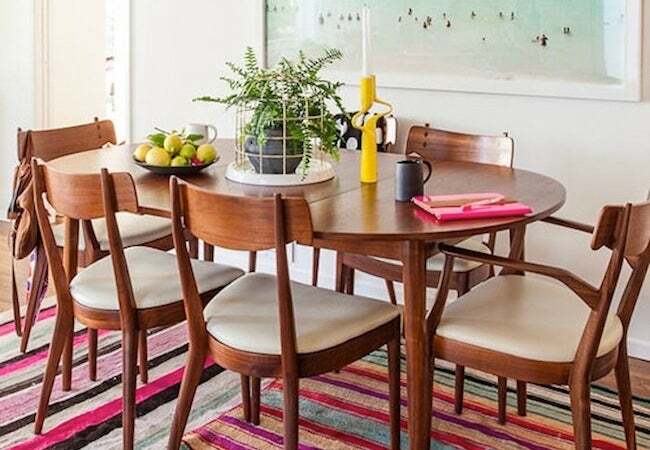 True: Chairs are more comfortable, but on those special occasions when you’re feeding a crowd, you can always squeeze in more guests if you temporarily swap the chairs out for a couple of sturdy benches—one to run along each side of the table. Don’t own any benches? Make one! A pendant or flush-mount ceiling fixture provides the light you need to dine by, as well as the finishing design touch. Just be careful not go overboard. 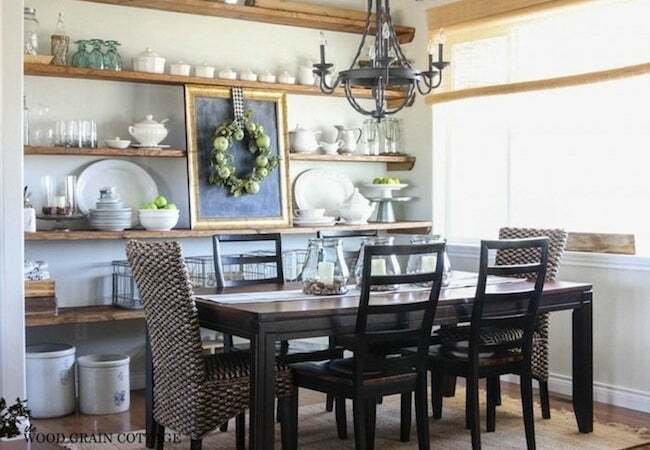 Overly large or elaborate light fixtures dominate small dining rooms, and not in a good way. For a streamlined yet stylish effect, opt instead for a compact fixture in a color that matches the walls. In a small dining room, once you’ve added the table and chairs, there’s precious little room left over for flourishes. And if you force those decorations to fit, the room’s going to look busy and cluttered. So, word to the wise: Resist the temptation to display dozens and dozens of photos. Pursue a more serene look by hanging only one large-scale painting or print. 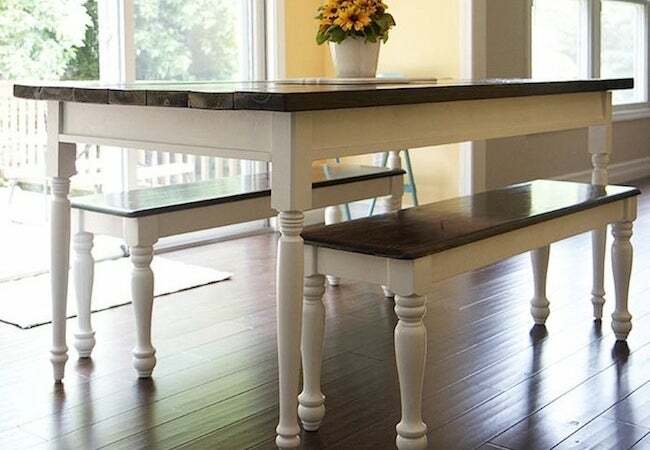 If your dining room lacks the floorspace for a full-size table, consider compromising with a clever, space-saving solution like this one. 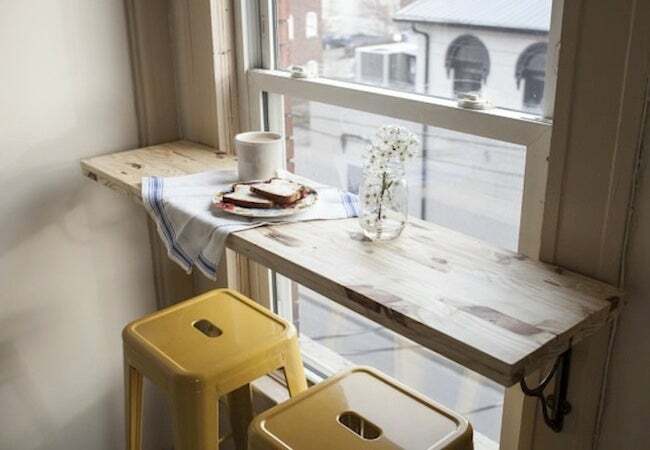 A charming addition and surpassingly easy to DIY, this corner cafe barely projects into the middle of the room, with its attendant bar stool slipping easily under the table surface when not in use. Multitasking furniture—it’s a beautiful thing, because it enables you to do more in less space. For instance, while the shelves of a bar cart may hold extra dishes and utensils, the surface can function as a buffet station. 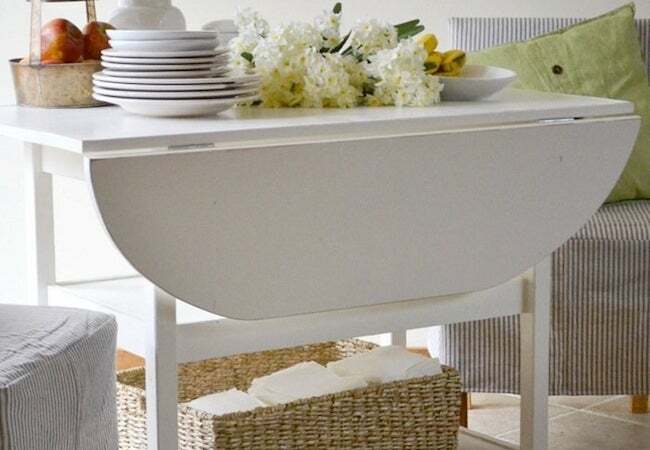 Likewise, if you have a bench with built-in storage, you can seat extra guests even while storing linens and things away from view. Tall curtains create the illusion of higher ceilings and inject a pop of eye-catching color or pattern in the process. For best results, locate the curtain rod as close as possible to the ceiling (not necessarily within the window frame), then to finish the job, add curtains that hang all the way down to the floor, stretching the full height of the wall. Don’t discount the idea of folding chairs. If your dining area would accommodate more seating than you need on a daily basis, you can store the extra chairs in a nearby closet until the day you need them. Closets already stuffed to capacity? Collapse the chairs and mount them right on the wall, with their weight supported by heavy-duty hooks. 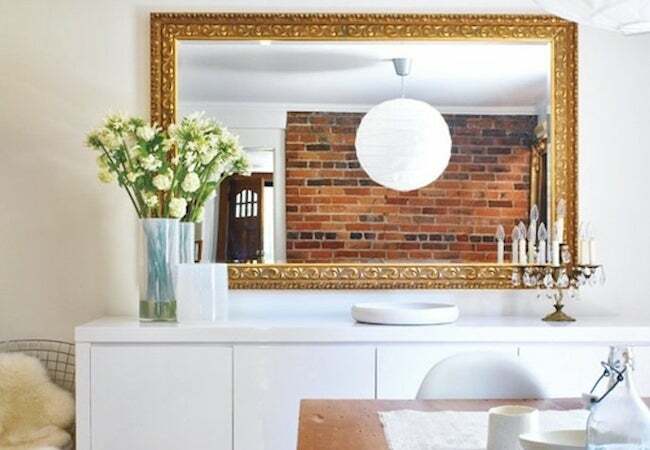 This is a classic trick, an oldie-but-goodie that works like a charm: Use mirrored surfaces to bounce light through the dining room, fostering an artificial sense of airy openness. Mirrored furnishings magically blend in, becoming practically invisible. But for those less daring, there’s an effective half measure—mounting a mirror on the wall. Dining tables with drop leaves have been around for centuries, for one timeless, practical reason—the design makes it quick and easy to extend your table when necessary for holidays, parties, and other special events. When the guests go home, simply collapse the leaves (or remove the extensions). Complicated? No. Genius? Absolutely.